Miss Mustard Seed Is Coming To Town! 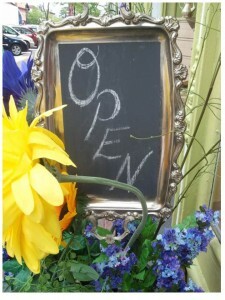 Miss Mustard Seed is coming to Rochester, New York! 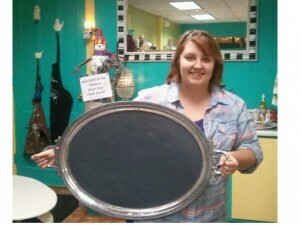 Miss Mustard Seed Milk Paint, that is! 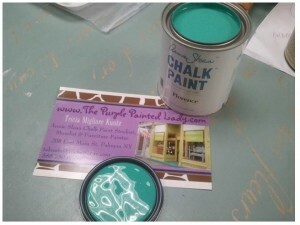 For those of you who love the look of Milk Paint or even the chippy look & enjoy making your own paint….get ready! 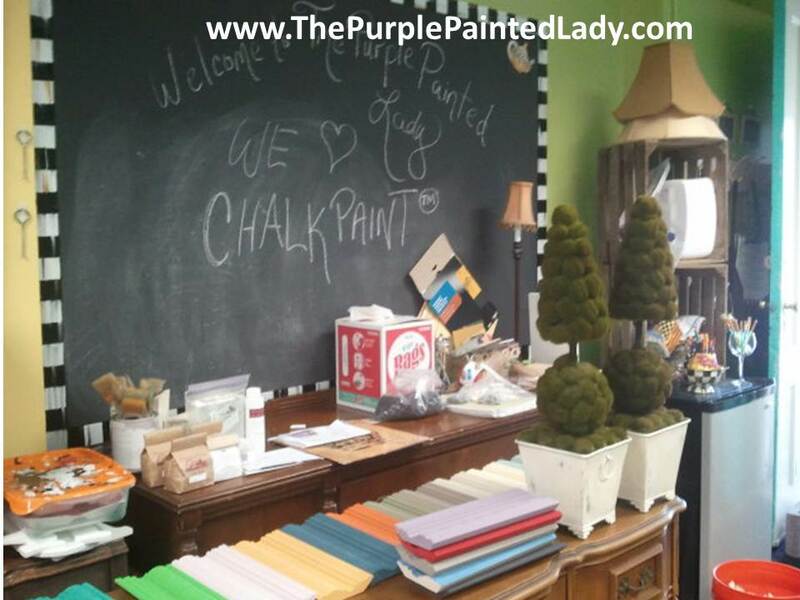 And in case you would like to understand better the beautiful qualities and the differences between Milk Paint & Chalk Paint™….here is a great read by Miss Mustard Seed herself. Click here to launch her page. How Durable is Annie Sloan Wax? This post is in honor of Dave DeLuca and the question I received from him today! 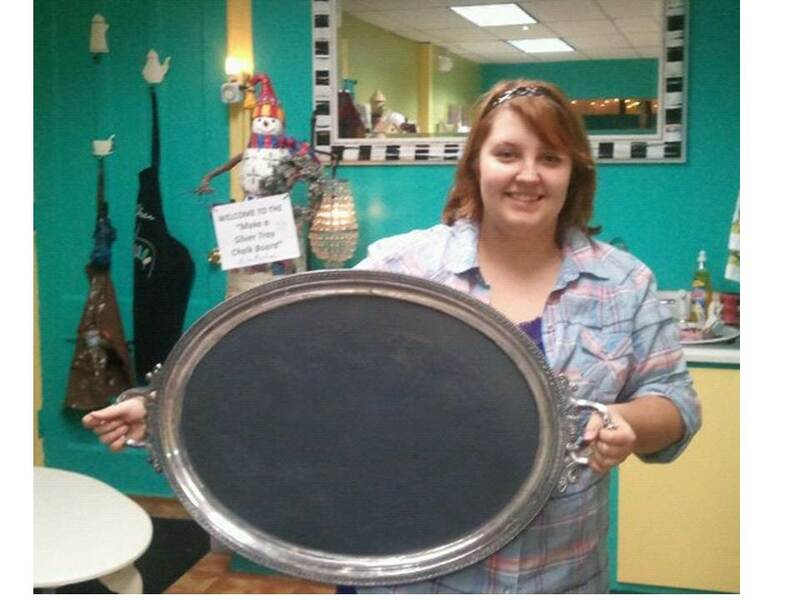 I just finished painting this piece with Old White Chalk Paint® decorative paint by Annie Sloan. I forgot to purchase the wax when I ordered paint from you so now, I need to go ahead and do that. 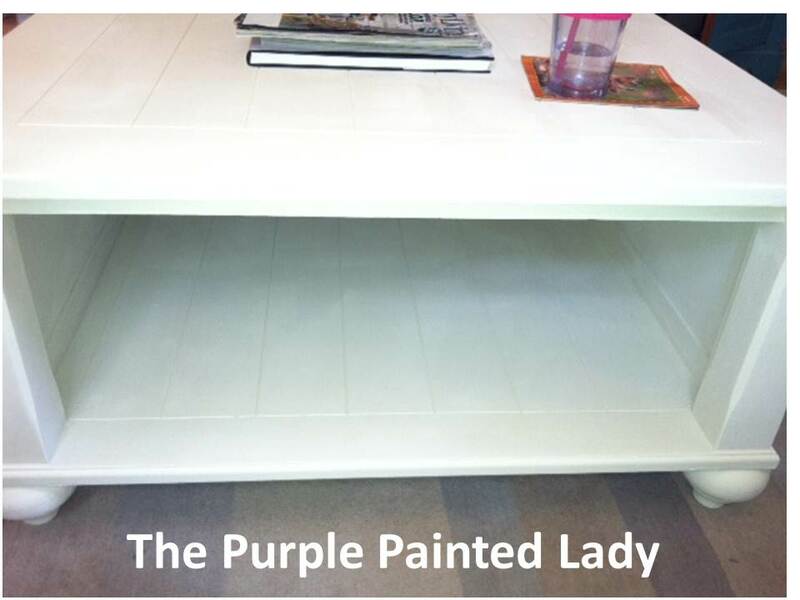 Do you think that would be best for a coffee table that will get tons of use, feet, sticky toddler finger etc. First off- I love your coffee table. Great job with painting it! I painted my workshop table here at my shop with Chalk Paint® decorative paint by Annie Sloan and then did the wax as a top coat. I did 2 coats total. 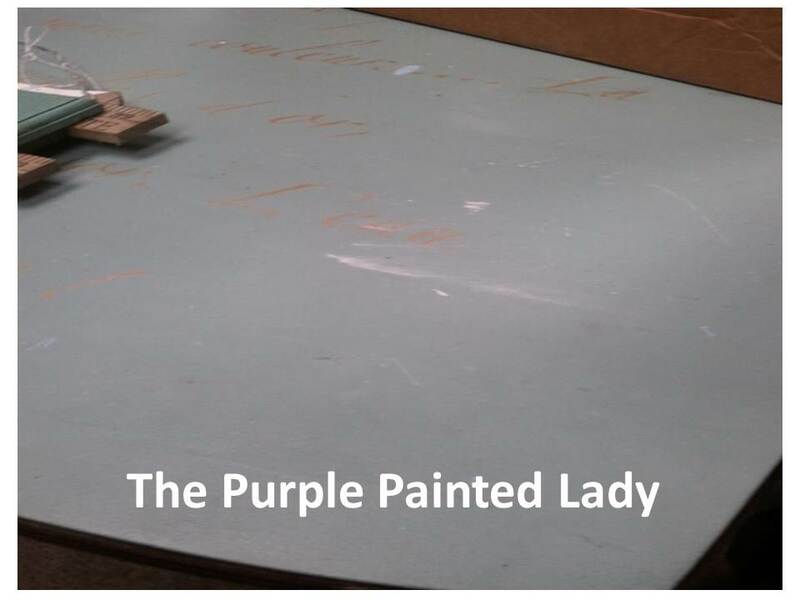 I beat this table up every day with placing whatever I am painting on it; metal chairs, side tables, – you name it- it goes on here. We also use this table for workshops. Paint splatters on it, the metal when dragged across sometimes leaves a grey line. But what I love about wax for a top coat- is that it is very forgiving. So- to show this- I took a photo of a section of my table right now. It has paint spilled on it and some scuffs from unloading a delivery on it. 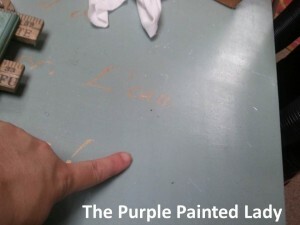 Using my finger, I scratched off the paint on the table that was not suppose to be there. In this case- it is the Old White that spilled on my Provence table. Does this mean you can bake chocolate chip cookies- take them straight out of the oven and then, place the hot cookie directly on this? 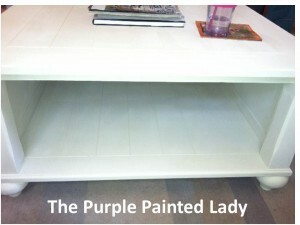 And- something to note about a wax top coat that I (The Purple Painted Lady) personally loves – is if the cabinets or coffee table top gets scuffed, let’s say by the black rubber bumper around a vacuum for the cabinet, or a scuff mark from shoes on the coffee table top, or filthy finger prints – just put a little wax on a rag and wipe the scuff off. It is that easy! Do I have to rewax annually? Applying wax to furniture and having to schedule regular maintenance to rewax – would be a pain in the derrière! Once you have applied a couple of wax, having to rewax in a year or two is not necessary. I will often say, :some people use theor furniture and some people abuse their furniture.” For those of you who USE it….a thorough wax application should last you for years! For those of you who have 6 children under the age of 8 who play on your furniture with match box cars, crayloa crayons, markers paint, and climb on it with their sneakers….YES! You bet, you will need ragular maintenance. For me and when we paint kitchen cabinets for clients, I always give my kitchen cabinet painting customers a tin of wax once the job is done for things like if the black, rubber bumper on your vacuum scuffs the kickplate of your cabinets. Or, someone with driveway asphalt grease leaves a handprint. OR, your little Picasso draws on the cabinets with crayons. Then, take a little fresh wax on your pointer finger and rub it over these areas and then wipe away. This fresh wax will rejivenate the older wax beneath and the stain from any of the examples above, will be lifted away. For regular maintenance, just a little soap and water on a rag is totally sufficient. But otherwise- you do not need to re-wax for years! So the wax cures to be strong- does this mean you can complete the NY Times crossword puzzle on your table? NO! 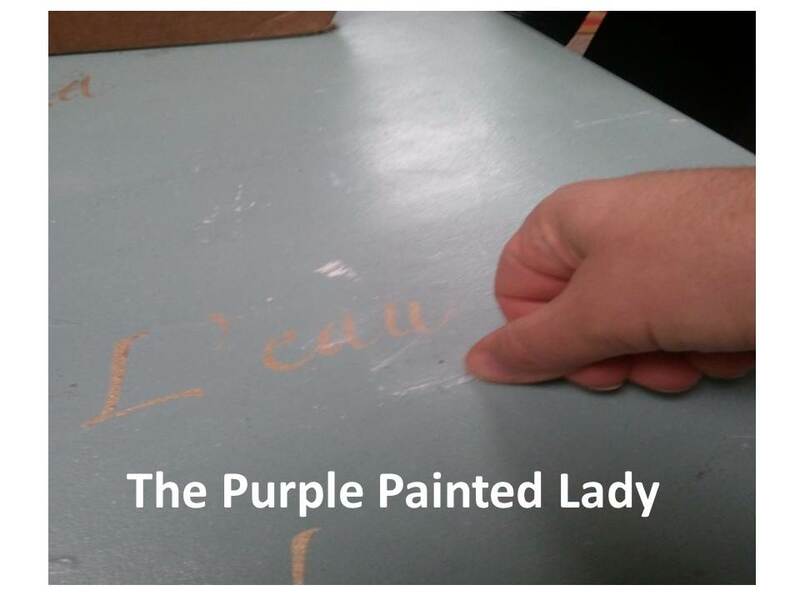 Just like any fine piece of furniture- use a place mat if you are going to write on the table top. Wax cures to be quite strong, but the force from the tip of a pen or pencil is quite strong and you can leave an impression or indention possibly. But again, in general, to maintain your table -you can wipe it clean with a damp washcloth and for scuff marks, just buff them. Again, I always give my clients that I paint kitchens for a new tin of wax because I have found that often to remove bad smudges or scuffs, especially the ones that come from the black runner on shoes…I use a little clear wax on a rag and it erases the marks as soon as I wipe them. I hope that this information was helpful!!! If you are brand new to waxing, before starting your whole project – do this! => Take a small amount of Annie’s wax on your pointer finger. 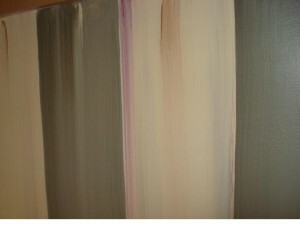 (like the amount you would use if putting lip balm on) Then, take your finger and rub the surface of your painted piece. Make a circle about the size of a quarter. once done- wipe that area with a lint free rag. Now….look at the difference between the waxed area and the unwaxed area. This is how you want you whole piece to look after waxing. When you wax Chalk Paint® – one of the amazing instructors for all retailers has shared this analogy with us to help in the understanding of how thin to apply it. Barb said, when you wash your hair and put conditioner on it- what do you do next? You wash it all off. Why is that? Because your hair absorbs only what it needs. If you leave extra conditioner on thinking it is going to make your hair better, what does it actually do? It gives you a lousy hair day. This same concept applies to the wax. And in case you still are not grasping how thin to apply the wax….you know you have too much wax or uneven was when you see streaking in the wax. First- always try to rub or buff a bit more. Make sure that all the wax is dry and that the streaking is not due to do to premature buffing before all of the wax has dried or too much wax. Additionally- I often receive the question- what is in the wax? Linda asked, Is mineral spirits in the wax? Is it wax (like a pure candle wax) and mineral spirits mixed together. Just curious. Not wanting to make my own just curious to know what is in it. Annie’s wax is a composition of various components- and her total formula, ratios and ingredients are proprietary….just like every other product on the market ranging from make up to Kentucky Fried Chicken or Coca-Cola. But I can share that there is Bee’s Wax- which is pretty self explanatory. There are a lot of furniture waxes on the market…but Annie’s wax has over two decades of perfecting the composition and usage of her wax with her paint. 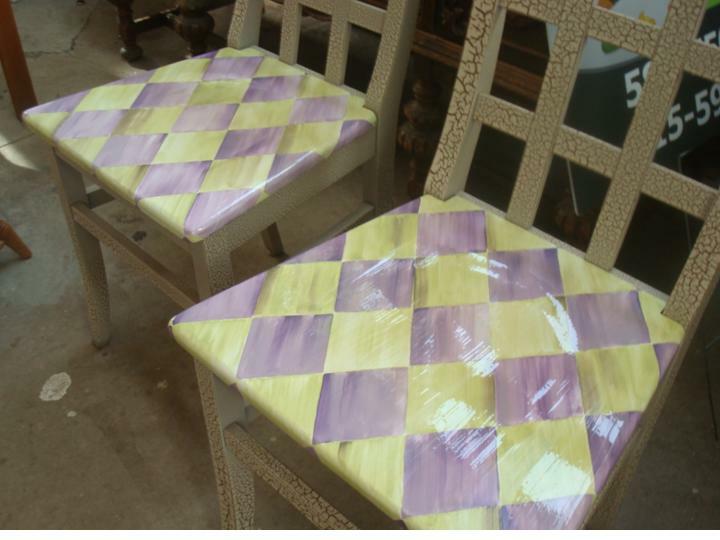 Be rest assured- that whatever you are painting and waxing- has already been done using Annie Sloan’s products! 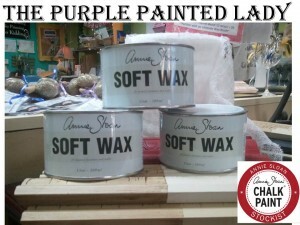 So there is nothing nicer out there in the marketplace to use on furniture than Annie Sloan’s Soft Waxes! I hope that this was helpful. I have always wanted to go to Venice- but Florence makes me happy too! Someday- I plan on going to Venice and having a Bellini at Harry’s Bar & Grill! Someday- I will go with my husband Steve (my best friend) and my beautiful daughter Danni. But until then….Florence makes me happy too! Ti amo Florence!!! You are vibrant, fresh, and you are here!!!! 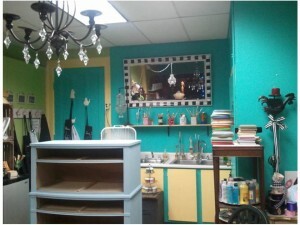 Hopefully, by the color on the walls of my workshop space- you can see I loved you before I even met you! All Florence orders will be shipping out tonight!!!!!! Sweet dreams fellow artists! 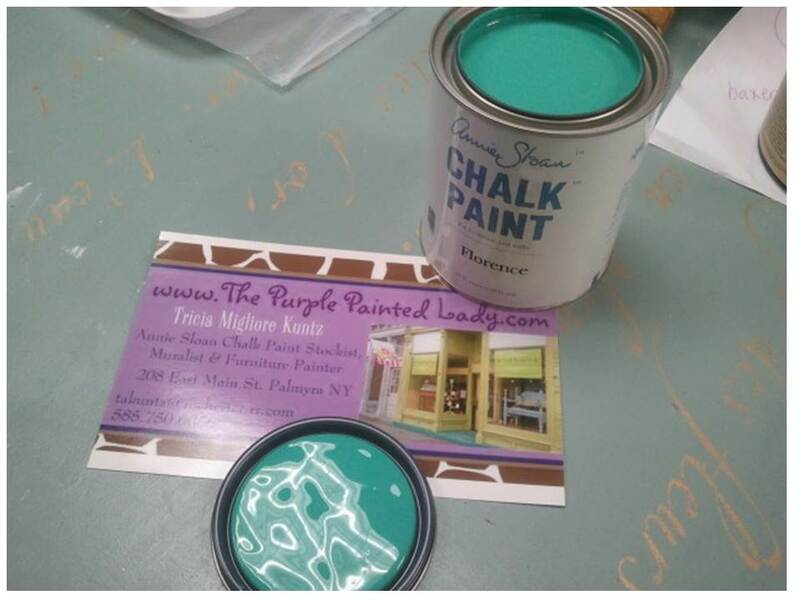 SINGLE SWIPE Painting Workshops! ~ STROKE OF GENIUS! Learn how to create depth and whimsy in our Stroke of Genius workshop – will be Wednesday & Thursday, June 27th & 28th from 10 – 12. If you are traveling a substantial distance – or in general prefer doing the whole workshop in one day- I will accommodate you. However, the only day that would be available is Wednesday, June 27th. 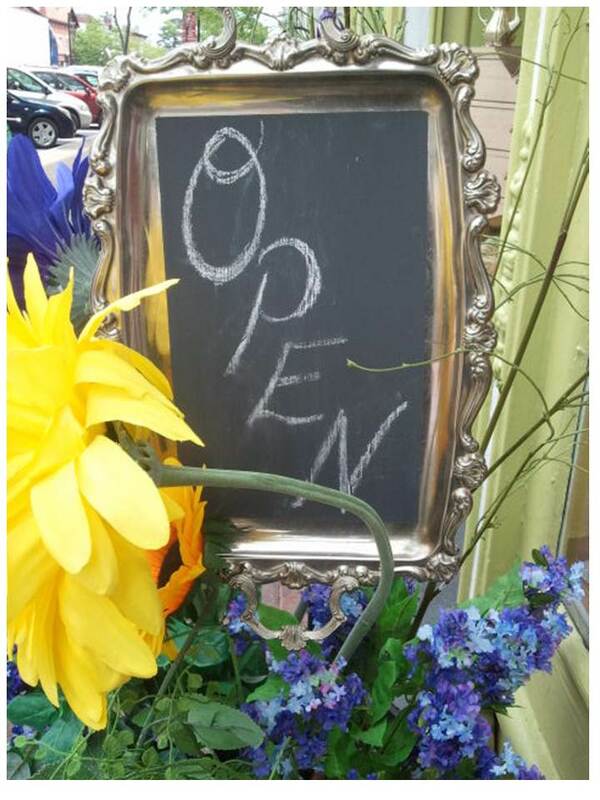 There are 5 openings….and it will be on a first come- first serve basis. Single Swipe in a Harlequin! GORGEOUS!!! !